Paris’ smog problem is causing some very bold action to reduce car use. Image from The Independent. Here’s some interesting and surprising news: Paris has banned cars. Or rather, that’s what some overly dramatic headline writers would have you believe. In reality the new policy is a restriction rather than a total ban. Cars with even and odd-numbered license plates being banned on alternating days. The law, which has been linked with a policy of free public transit is designed to combat smog, which in Paris has grown to proportions comparable with the notoriously polluted Beijing. In principle, the act of cutting Parisian car use in half should do good things for the reduction of smog, although in practice at least a few drivers are going to defy the ban. From a transitions perspective, this development actually looks very good. While government efforts to encourage sustainable mobility typically do little more than encouraging a few promising niche developments, this takes the crucial second step of actively discouraging the dominant unsustainable system. A tax-deductible bus pass isn’t much incentive compared to a lifetime of entrenched habits based around driving, a raft of commercial, social, and economic institutions based around the assumption that most people are drivers. The problem is that any policy that actively disrupts these habits and institutions will be unpopular almost by definition, as we saw in Canada when Liberal Leader Stephane Dion tried to propose a carbon tax in an election campaign. People don’t like being forced to change, even if they agree in principle that the change would be beneficial. The fact that Paris has imposed such a disruptive policy is therefore both encouraging and intriguing. The Parisian car restrictions appear to have gotten around this problem because they were created in response to a local crisis, namely smog, rather than a global one, namely climate change. This made the restrictions palatable to the public, who experience the unpleasant impacts of air pollution on a daily basis. This accords pretty well with some reading I’ve been doing in social movement theory, which holds that in order for the public to accept a narrative and the actions that follow from it, it must have (among other things) experiential commensurability. In other words, it must accord with the lived experience of the public. This is bad for action on climate change, because it has a very low experiential commensurability. Even if people accept the reality of man-made climate change, there is still very little opportunity for them to directly experience its consequences, which occur for the most part either far in the future or in faraway countries. This makes it very difficult to motivate for the kinds of inconveniences that the public must suffer in the transition to a more sustainable economy. The strategic implications of this are pretty clear: Environmental activists should frame their proposals as the solutions to acute, short-term, localized environmental problems. When such problems are successfully mobilized as support for local transitions, then these can be held up as an example for the rest of the world to follow. But this raises some problems. It is possible, for example, that somebody will find an easy way to solve the short-term problems without addressing the long-term ones? What if better means of cleaning car emissions reduces the impetus to restrict cars for the sake of local air quality, while they continue to contribute to global climate change? There is, furthermore, something a little bit perverse about relying on people’s short-term suffering in order to achieve our longer-term goals. If it takes an air quality emergency to get Parisian authorities to finally put pressure on the car regime, then does that mean that climate activists should be rooting for similar crises to emerge in other cities? So I think transition-minded environmentalists should see this situation as a bit of food for thought, both for our political strategy and for our ethical principles. We need to think hard about how local crises can be leveraged for global benefit, but we also need to think hard about what this strategy ultimately means for the soul of our movement. Predictably enough, the phenomenon of the glasshole appears to be localized around San Francisco, and like other technological controversies over technology that are appearing there, it is getting global media attention. The top-voted Urban Dictionary entry for glasshole has been upvoted over seven thousand times, and a google trends search for the term shows that its use is rapidly increasing. Google should pay more attention to their own analytical software, because the popularity of the term “glasshole” is very, very bad for them. If it catches on much more than it already has, then Google Glass, and perhaps the entire concept of wearable computing, is dead in the water. It may already be too late. Basically, Google is at risk of creating a symbolic lockout of their product. Lockout occurs when prevailing social, economic, or political advantages make it impossible for a technology to have any real impact, regardless of its merit. The classic example of lockout is the DVORAK keyboard, which is far more efficient than the traditional QWERTY keyboard, but it is locked out of the market because its widespread adoption would require a complete rearrangement of how typists are trained. Symbolic lockout is a little bit different. It occurs when the public understanding of a technology develops in such a way that they will never be interested in using it, and a lockout effect occurs. An excellent example of this can be found in the early history of the electric car. Around the turn of the twentieth century, gasoline engines were noisy, smelly, difficult to start, and unreliable. By comparison, it was possible to simply step into an electric car, start it with the push of a button, and be reasonably confident that it would run well enough to take you home in one piece. This created a significant market for electric cars. Gasoline cars, however, were not without their advantages. They were faster, they could climb hills better, and they could go farther than their electric counterparts. This made them ideally suited for the highly masculine activity of touring. The mechanical competence required to run a gasoline car also had masculine associations. While gasoline cars were seen as adventure machines, then, electric cars, meanwhile, electric cars were instead used by wealthy women for promenades in city parks. This caused a big problem for electric car makes when gasoline cars started to become more convenient and comfortable to drive. While this made them more attractive to women, the feminine associations of electric cars meant that no man would dare be caught driving one. To this day the makers of electric cars have to contend with public perceptions of their products as effete, while gasoline vehicles continue to be marketed using masculine associations with adventure and toughness. Google is risking a very severe symbolic lockout of Glass. As the public begins to internalize the idea that people who use glass are jerks, they will refrain from using it, lest they be seen as jerks. If this happens, then Glass will fail, and it could take the entire idea of wearable computers with it. I don’t want to see this happen. I think the idea of wearable computers is a pretty neat one with some interesting potential, even if there are problems to be surmounted. So I have written two pieces of advice for Google. I offer them free. You’re welcome, Google. Firstly, google needs to find a way to rein in their explorers a little bit. These people are representing Glass to the world, and they’re being allowed to make a very bad first impression for the technology. Measures to fix this have to go beyond polite suggestions to be nice. Google could use its leverage as the provider of the device to impose some restrictions on its use. Any new explorers should have to sign a contract that allows Google to take the device back if there is evidence that they are being a glasshole. Secondly, google needs to modify the Glass hardware to mitigate against its worst abuses. Most of the complaints about google glass seem to come from the camera. People don’t like the idea that they are being constantly photographed and Glass makes it difficult to ignore that this is happening. I suspect that objections to Glass would be considerably reduced if the constant threat of filming was removed. This could be accomplished by making the camera removable, or creating a way to turn it around backwards to signal that it is not active. An appropriately stylish piece of plastic could be designed to fit over the lens and obscure it. Hell, a piece of duct tape would do the job. If Glass could be temporarily reduced to a cell phone with a heads-up display, then people would probably be less concerned, and there would be fewer incidents. If the Glass design team (who I’m sure are reading this post) aren’t impressed by my suggestions, I’d like to point out to them that it’s now over a century after the first electric cars were built, and we’re just now seeing their potential again. Hopefully Google is smart enough to avoid making the same mistake. If not, then we’re all going to have to resign ourselves to keeping our phones in our pockets for the time being. 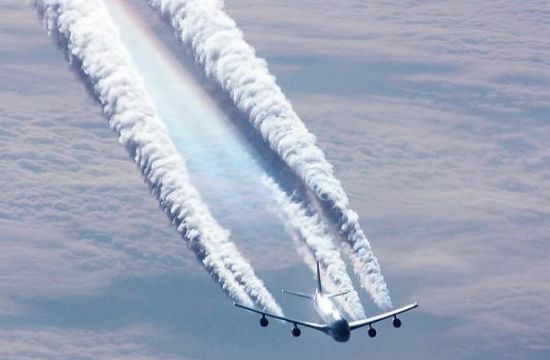 Those contrails contain A LOT of carbon. We have to stop doing so much of this. Image from greendiary.com. Last week, I complained about how hard it is to take a ferry to Spain, and used that as a jumpoff point to write a somewhat rambling post about the complex ways that our unsustainable travel habits are entrenched . This week I’m going to continue on that thread, by discussing the way I ultimately and reluctantly wound up booking my travel to Valencia, namely flying. I’m going to consider if there’s any way that such an environmentally destructive form of transportation reasonably justified, particularly through the mechanism of carbon offsets. When you really look at the data concerning the emissions generated by flying, the results are actually quite shocking. Carbon calculators differ on the exact measurements, but based on a survey of a few of the options, it seems entirely plausible that if you include the radiative forcing caused by contrails, a single round-trip transatlantic flight contributes more to climate change than an entire year of commuting 60 kilometers every day in a hummer. That means that despite my cycle commuting, preference for train travel, and quasi-veganism, my flight home for Christmas already makes me a profligate contributor to climate change, even by first-world standards. Even more depressingly, nobody appears to be working on an electric jet engine or any other form of more sustainable aviation. Apparently there is simply no way around it: Suspending human beings in the air and accelerating them to near-supersonic velocity so that they can travel across and between continents will always consume a very large amount of energy, and that energy will probably come from fossil fuels. The inevitable conclusion is that we need to stop flying so much. This is a tough pill to swallow, particularly for progressive environmentalists such as myself. The progressive world-view tends to value travel and cultural exchange, and so while you will find most of the political left enthusiastically advocating personal sacrifices such as cycle-commuting and veganism in the name of mitigating climate change, our practice of flying around the world remains conspicuously unexamined. When the question is brought up, the answer is normally to purchase carbon offsets, which pay other people to reduce their emissions in order to negate the extra emissions you cause by flying, or driving, or any other high-carbon activity. The idea basic idea of carbon offsets is not a bad one, though some environmentalists have compared them to the papal indulgences of medieval Catholicism. I’m not going to go into all the details of that argument, but you can find a good summary of carbon offsets here. In the rest of this post, I’m going to apply a transitions perspective to the problem, and ask whether the offsetting of activities like flying can do any good in a long-term transition to a sustainable economy.. If you’ve never purchased carbon offsets before, one thing that will strike you about them is how cheap they are. I can offset each of my round-trip tickets to Toronto for about $30. This is because we’ve done such a terrible job promoting a sustainable economy so far that there are a lot of low-hanging fruit. The free distribution of energy-saving lightbulbs to people who would not ordinarly buy them, for example, is a very cheap way to cut a lot of emissions. Building renewable energy infrastructure, particularly in the developing world, is another popular option. The good news about this is that it means that it is possible for a lot of people to be able to afford to offset. The bad news is that if all goes well, carbon offsets will eventually mean that the world is full of energy-saving lightbulbs and wind turbines, making it much harder to offset emissions from our flights. At that point, offsets are going to get much more expensive, because we will have to pay other people to change their lifestyles in order to accommodate ours. On the one hand, a big pool of free money available for projects to install sustainable infrastructure that wouldn’t ordinarily be installed is definitely a very useful way to encourage a transition to a more sustainable economy. Niches for new technologies to develop before they are economically competitive are a very important part of any transition, and ideally carbon offsets should provide a ready supply of funding for engineers and entrepreneurs working on low-carbon technology. Once these innovations are sufficiently developed, carbon offsets can provide a powerful incentive for their adoption. But on the other hand, a transition to a more sustainable economy must ultimately change more than just infrastructures and technologies. It must also change habits. The only reason that citizens of developed countries can all continue to fly around the world while offsetting their emissions is that there is a huge mass of much less wealthy people on Earth who emit far less than we do. But if the situation of these people improves (as it should), then this will no longer be the case. If the entire population of India suddenly has the money to fly to islands in the Indian Ocean for vacations, and if these people are in the habit of offsetting, then the price of carbon offsets will skyrocket. Given the very high emission generated by flight, the only possible way to avoid climate catastrophe is to make sure that not very many people fly. Currently this is accomplished by economic disparity. First-world climate activists therefore have two possible choices in the long term: stop flying so much, or keep the poor down. No amount of carbon offseting will change that. The dilemma here is that while carbon offsets can provide an incentive to make technological systems more sustainable, they provide an active disincentive for people to make changes to their daily lives. And both things are required if we’re going to stave off climate catastrophe. The only solution to the dilemma that I can see is the absolute commitment of first-world consumers to offset their emissions, regardless of how expensive the offsets become. That will force people to change their habits when they can no longer afford to offset them. If you must fly, drive, eat meat, or do anything else that emits a lot of carbon, then you must offset. You should commit to offset all your emissions to the point that your net carbon impact is around 1.5 tons CO2 per year (which should be our goal by 2050, according to this guy). Persuade others to do the same. Maintain that commitment regardless of how expensive offsetting becomes in the future. If you can no longer afford to offset your lifestyle, then you have to change it. No exceptions. Accept that this will mean your flying days are numbered. The same thing probably goes for eating meat every night of the week, or commuting by car. Plan accordingly. This post has focused mainly on flying, but it applies to our first-world lifestyles more generally. First world consumers in particular have an absolute ethical duty to fight against climate change, since they are the cause of so much of it and they will be among the last to feel its effects. This means we need to choose smart strategies not only to alleviate the effects of our lifestyles in the short term, but also to wean ourselves off of these lifestyles in the long-term. Carbon offsetting is one possible way to do that, but only if it is applied with both intelligence and commitment. I have to confess that I’m being a bit hypocritical with this post, as I’ve never bought offsets before. But I’m going to start right now, with that trip to Valencia. So should you. Cars embarking on the cross-channel ferry at Dover. Is this really the most efficient way to carry people across water? I’ve recently been invited to speak at my first conference. Even more exciting than that is the fact that the conference is being held in Valencia, Spain. So within literally half an hour of receiving my formal inviation, I came up with a very exciting plan: Go to the two-day conference in Valencia, and then go find a nice Spanish beach to lie on for the rest of the week. I immediately commenced procrastinating from my real work by planning my trip from Manchester to Valencia. Being a bit of a hippy environmentalist who loves trains and boats and hates sitting in front of screaming babies on planes, I looked for a some combination of rail and ferry networks that would get me there. This turned out to be frustrating, however. Partly because the Spanish rail network is an a bit of a shambles, but more importantly because many of the ferries from Southern England to Spain do not allow foot passengers on board. It is this last point that I want to riff on a little bit in this post. If the fact that many of our major water-borne transport networks can’t be boarded without a car isn’t a knockdown demonstration of car culture, then I don’t know what is. Even those ferries that do allow foot passengers often put them at a considerable disadvantage. I know from experience that such boats often require foot passengers to disembark using a bus that drives off the boat after all the drivers have already left, which effectively adds at least half an hour to the journey time. And port facilities are rarely well-connected to railway or bus terminals. I’ve had to walk over a mile to catch a ferry in the past. The reason this is so problematic is that ferries are the only really sustainable way to travel over water. My flight to Valencia, which I reluctantly booked after two days of fruitless searching for a viable ferry itinerary, will emit 0.3 tons of carbon dioxide each way, which will add up to a whopping 40% of my ideal annual carbon budget over the course of the whole trip. So if we are going to transition to a sustainable economy then ferries are going to have to play a big role. The problem here is that, under the status quo, in order to avoid using the most environmentally destructive form of transport on the planet (flying), it is highly advantageous and sometimes mandatory to own a car, which happens to be the second-most environmentally destructive form of transport on the planet. There is very little space for people who choose to forego both technologies, and this is a problem. What I’d really like to see here is an alternative ferry system, designed specifically for foot passengers. It would involve boats that are big enough to carry a large number of passengers safely across the English Channel, but not the behemoths designed to carry cars and trucks. I would like to see these boats making quick, cheap, efficient trips across the channel, in which people would embark on foot from a small pier, rather than having to wait for countless vehicles to be painstakingly loaded on at a gigantic terminal. Of course, I have to confess that I know virtually nothing about the ferry business, and there are probably a lot of very serious problems with the suggestion I have just made. It would, at the very least, require considerable changes to port infrastructure and dominant travel habits. It would also require a major change to how customs and immigration services are managed. More border guards would have to be built at more ports, and they would have to be built with foot passengers, rather than a stream of motor vehicles, in mind. I’m no more an expert on customs and immigration than I am on passenger marine travel, but somehow I doubt that border agencies could easily be persuaded to do such a thing. This brings me to the final point of this somewhat rambly post: Maybe border guards are an unexamined part of the transport system. Border stations are expensive, and immigration agencies probably save money by building a small number of big checkpoints at major transport hubs. I’m willing to bet that a small ferry entrepreneur couldn’t simply request one wherever she needs it. Since most long-distance travel takes place between separate sovereign states, modes of transport that connect to pre-existing border control points at airports and large ferry terminals have a major advantage over alternatives. This locks in established unsustainable transport systems. Even the land border between Windsor and Detroit-the most highly trafficked border in the world-requires pedestrians to board a “tunnel bus” in order to cross the Detroit River between the United States and Canada. So groups like No One Is Illegal can add one more argument to their arsenal: Borders contribute to climate change. The general point I’m trying to make here is that the systems that entrench environmentally destructive technologies manifest themselves in complex and surprising ways. We build boats that can only be boarded by cars, and the legal structure of international travel encourages the use of pre-established transport systems. If we want a more sustainable future, then we need to be critical of all this stuff. And we need to have the courage to change it.